We didn’t have to wait very long to see the 14-year-old who wowed us at Augusta to be back in action on the PGA Tour at it again. 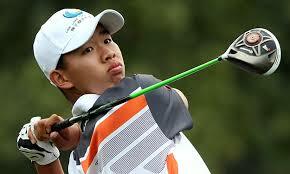 Guan Tianlang is in the field this week for the Zurich Classic of New Orleans playing on a sponsor’s exemption. And he picked up exactly where he left the Masters a couple of week ago. After winning the low Amateur award at the 2013 Masters, Tianlang shot an even-par round of 72 for the first round of the Zurich Classic on Thursday. And TPC Louisiana isn’t exactly a short golf course. It’s every bit as long as Augusta National, stretching to more than 7.400 hundred yards. But as accurate as players on the PGA Tour are with their 8 and 9 irons, that is what the 14-year-old is doing with his fairway woods and hybrids. Tianlang stuck a 5-wood on the 215-yard Par 3 to three feet for a nice birdie. He did that all day long though. Sure, he is eight shots back of first round leader Ricky Barnes, but the fact that he shot a round at level par is another impressive feat in the blossoming and promising career of this young player. And shortly after Tianlang moves on from the Zurich Classic, which could be on Sunday if he manages to make the cut, he will go after the U.S. Open, trying to qualify at a local course for the sectionals. Tianlang will be in Dallas for the U.S. Open qualifying, for which he needs to get through the local and sectional qualifying rounds and he would be in the field. If he is able to qualify for the U.S. Open, it would be yet another thing to add to his 2013 season. This is something that 14-year-olds simply don’t do, and we think it needs to be getting some more attention. We are certainly going to follow his journey through the rest of the Zurich Classic, and then on into Dallas as he tries to qualify for the U.S. Open. The 2013 U.S. Open will be held at Merion Golf Club in Pennsylvania in June. This entry was posted in News, Opinion and tagged 2013 u.s open, 2013 zurich classic, Guan Tianlang, merion golf club on April 26, 2013 by Bryan.